Shadow Box Frame SB1010 White Ash Size 12x14 for 8x10 Kit Complete as shown with 3 Mats, Glass, Backing and Hardware. Shadow Box Frame Size 10x12 for Picture Size 8x10 or 6x8. The picture used is actually a size 8x10 print we choose to frame it in a smaller frame size 10x12 rather than the more normal size 12x14. 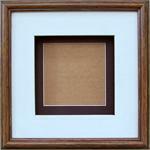 Shadow Box Frame SB1012 Pecan Brown Size 12x14 for 8x10 Kit Complete as shown with 3 Mats, Glass, Backing and Hardware. SB1012 Pecan Brown Shadow Box Frame Size 12x24 for Pictures size 8x20 inches. Complete as shown with 4 Mats, Glass, Hardware and Backing.